Find critical respiratory care information fast! Comprehensive and precise, this portable guide provides rapid access to vital respiratory procedures, facts, and formulas with an emphasis on critical care. It fits easily into your pocket, and the spiral binding allows it to lie flat on any given page. Whether you use it as a clinical resource, a study tool, or a quick refresher, this full-color resource offers quick access to just the right amount of practical, must-know information – essential for boosting your confidence at the point of care. A quick-reference format provides all of the key information you need with fast-access to respiratory care guidelines, including assessment, arterial blood gases, EKGs, medications, and PFTs. 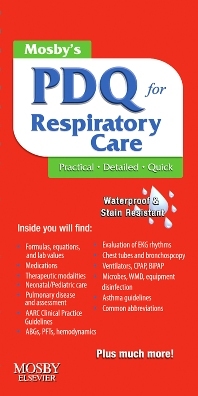 You’ll also find essential information on pulmonary diseases, equipment disinfection, and neonatal and pediatric care. Color coded tabs feature a table of contents with page references, making it easy to quickly locate key information within each section. Full color design includes illustrations and clarifies important facts to help you easily find what you need. Commonly used and updated clinical information, including tables, formulas, equations, algorithms, and lab values – all necessary to deliver safe and efficient care.